It’s hot. It’s Summer. Floaties are the fad. Like really cool inflatables. Pool parties are where it’s at this Summer so fire up the grill, get the kids in the pool, and let the backyard fun begin! Sunnylive, straight outta Australia is the “world’s leading Summer lifestyle brand, designed to service and enhance the best parts of life under the sun.” Conceived on the beaches of Sydney, the brand was established with a simple goal: to share Australia’s authentic summer style with the rest of the world. Pretty simple, we like it. And thank you Sunnylife for sharing the Good Vibes. 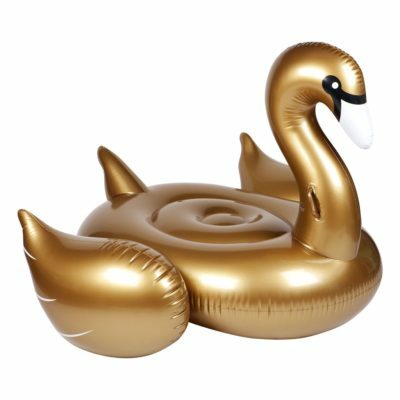 The Luxe Gold Swan is pretty awesome, the ice cream cone will cool off any young child, and who doesn’t love some pineapple in the pool? We do. Oh, and for the Hip Daddy in the pool with the kiddos, they have inflatable drink holders too…#justsayin. Let the backyard pool party begin! Sunnylife has you covered. And don’t forget to check out their awesome IG page too…#loveit.